Sofia Urban Mobility Centre (tel: +359 7001 3233; www.sofiatraffic.bg) operates Sofia's trams, buses and trolley buses, which currently have no night service. Tickets are sold in kiosks at the major bus stops and newsagents, and must be validated on board using the metal punchers near the windows. Passes or transit cards, valid for one day or one month, are also available. Karta (coupons of 10 tickets) are valid on trams, buses, metro and trolley buses. These reloadable smartcards enable users to top up and then swipe the card for each journey at the entrance to the vehicle. The Metro system (www.metrosofia.com) has two lines and runs until midnight. Line 1 connects Obelya to Tsarigradsko Shose, while Line 2 runs between Obelya in the north and Sofia Airport. Day passes, which are valid on trams, buses and trolley buses, are also available from Metro stations, kiosks and shops. For many years Sofia’s taxi drivers had a reputation for ripping off travellers. While most are now honest, it still pays to be vigilant. Official taxis operate using a meter and are yellow, though there is also a fleet of green, eco-friendly Toyotas driving around the city. Always check the meter is running when you get in a taxi. Taxi ranks are located at strategic points throughout Sofia, and you can hail one anywhere near the city centre. A tip of 10-15% is common practice. If you want to book a taxi, the most reputable firm is OK Supertrans (tel: +359 2 973 2121). Alternatively, use Radio CB Travel (tel: +359 2 912 63). Negotiating Sofia's interweaving paths of pedestrians, cars, trams and buses during rush hour can be tricky. However, once away from the city centre, traffic runs quite freely along wide, open boulevards. Street names outside the centre are almost exclusively in Cyrillic so, even with a map, orientation can be difficult for drivers who only read Latin script. Parking in the city centre is limited to two hours in designated Blue Zones, which are found on Ploshtad Narodno Sabranie, Ploshtad Alexander Batenburg and Ploshtad Alexander Nevski. Parking vouchers are usually sold on the spot by parking attendants, though you can also pay in shops or by SMS (tel: 1302) if you are with a local phone operator. There is also a Green Zone for parking, which charges a low fee for four hours. Unsurprisingly, Green Zone spots are not so centrally placed. The Green Zone SMS number is 1303. Cars can be hired by visiting drivers over 18 years old, on presentation of a passport and valid international driving licence (held for at least one year). A credit card number is requested and a valid international insurance policy is also necessary. Full insurance is advised. 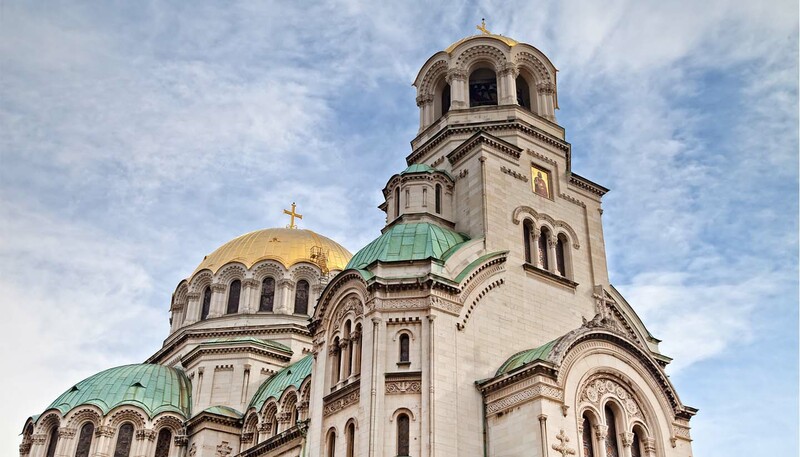 International providers in Sofia include Avis (tel: +359 2 945 9224; www.avis.com), Europcar (tel: +359 2 945 9266; www.europcar.com) and Hertz (tel: +359 2 945 9960; www.hertz.com). Sofia Bike (tel: +359 8855 23630; www.sofiabike.com) rents out bicycles and runs cycling tours of the city from April until November. Bikes can be hired out for three hours or by the day. Discounts are available for longer rentals. Although Sofia is relatively flat, few cycle paths currently exist. Evlogi Georgiev Boulevard and Vitosha Boulevard both have marked cycle lanes, but more central and suburban routes are due for competition in the coming years. 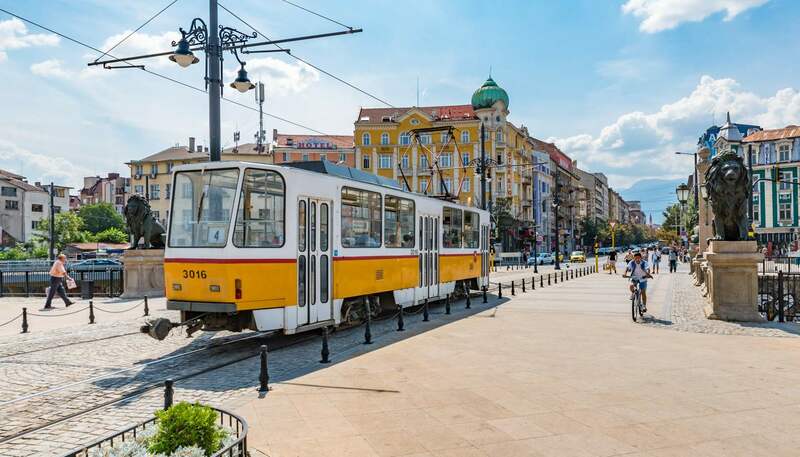 A city as beautiful as its name, Sofia boasts onion-domed churches and Soviet-era monuments interspaced with manicured gardens and wide cobblestone avenues plied by rattling trolley buses.